Ten people were hospitalised after an American Airlines flight from Athens to Philadelphia ran into terrible turbulence shortly before landing. Three passengers and seven cabin crew were taken to hospital for treatment, but have since been discharged. There was no warning of the turbulence from the plane in front, so the turbulence caught the pilot and crew unawares. 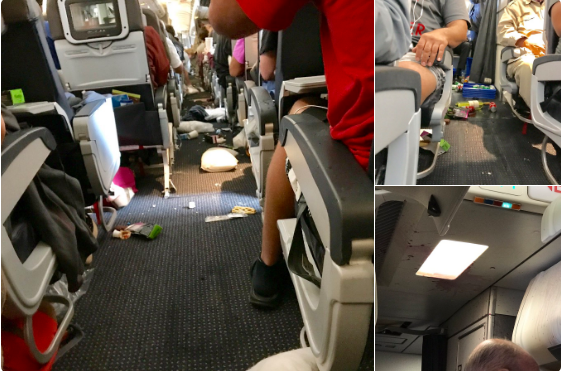 Seat belt signs came on at the start of the incident, but the flight crew did not have time to return to their seats following the serving of drinks. The turbulence lasted a total of about 30 minutes, before the plane – with 287 passengers on board – eventually landed safely at Philadelphia. Passengers and drinks were said to have literally hit the ceiling during the incident, as the plane effectively went into freefall at times. One of the flight crew suffered a dislocated shoulder, and was treated by a medic on board who relocated the shoulder.